Melanie Joseph, a recent graduate from Sparrows FET College, now working at Sparrow Foundation School. Staff and students delighted to receive the first tablets at Sparrow Schools. When Mr Norval (Science teacher at Sparrow Schools) returned from London after the first Teacher Exchange Programme between Dulwich Prep London and Sparrow Schools, he was driven to incorporate technology in his classroom. After spending two weeks at Dulwich Prep, Mr Norval witnessed the benefits of using technology to support the education of pupils at Dulwich Prep London, and wanted the same of his class in Johannesburg, South Africa. Whilst Sparrow School staff and students were enjoying their summer holidays, the two teachers who took part in the Teacher Exchange Programme decided to contact Apple to see if they were willing to donate iPads to Sparrow Schools. These iPads would bring technology into the classroom, which would contribute to the school’s agenda for the new term. On Tuesday 7th of February, Sparrow’s Grade 6 class had a special visit from a company called Poynting Direct which specialises in boosting antennas and wireless technologies in South Africa. Ivy Matlawa and Reabetswe Makwela brightened up the Tuesday morning Science class by dropping off the first tablet devices for the school. The faces of the children and Mr Norval lit up as the tablets were handed out to the class. 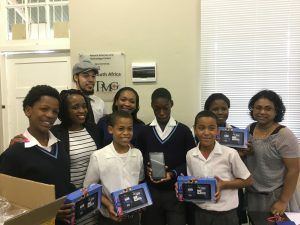 With the goal of supporting the integration of technology into the classrooms, the donation of these tablets came at a perfect time for the school. Sparrow School is excited to continue on the journey of incorporating technology in the classrooms to aid the pupils’ education. The next goal for the school is to introduce smart boards to help the teachers use technology in the classroom. Currently, pupils watch educational videos (or movies at the end of term) on a small laptop screen, if their teacher owns a laptop! How theTeacher Exchange Programme between Dulwich Prep (London) and Sparrow Schools (Johannesburg) is changing futures. Kagiso Magano, Richard Bernhard (Former Chairman of the Sparrow Schools Foundation, UK), Norval Petersen. Boarding an aeroplane, and leaving South Africa for the first time in their lives, Kagiso Magano (English Teacher) and Norval Petersen (Science Teacher), two young and enthusiastic teachers from Sparrow Schools, flew to London, England on 24th November 2016. The teachers were selected to take part in the first Teacher Exchange Programme between Dulwich Prep (London) and Sparrow Schools (Johannesburg), as part of a teacher development and relationship building project between the two schools. Norval and Kagiso spent two weeks at Dulwich Prep London, learning about the different teaching methods and resources at the school. It was also a great opportunity for the teachers to meet the UK Foundation Trustees and supporters based in and around London. The teachers spoke at assemblies and fundraising events to explain to donors how their money supports learners with special needs in Johannesburg. From the personal stories that the two men shared about the children they teach, the audience felt a deeper connection with Sparrow Schools, 5,500 miles away. Many pupils and teachers were shocked to hear about the lack of teaching resources at Sparrow Schools and have a renewed energy to support the school. Dulwich Prep London have been long-term supporters of Sparrow Schools and have visited the school in Melville, Johannesburg on several cricket tours over the years. Last year (October 2016), George Marsh, retired headteacher at Dulwich Prep and Founder of the Sparrow Schools Foundation, UK, visited Johannesburg for the first time since 2007 and saw how the money raised by Dulwich Prep and the UK Foundation has developed the school. The current headteacher at Dulwich Prep London, Michael Roulston, has continued the Dulwich-Sparrow relationship, with a particular interest in developing teaching methods and relations. The teachers arrived back in Johannesburg full of enthusiasm to share their experience with the rest of the school. Two teachers from Dulwich Prep will fly to Johannesburg later in the year to spend time at Sparrow Schools to continue sharing teaching methods and developing relations between the two schools. 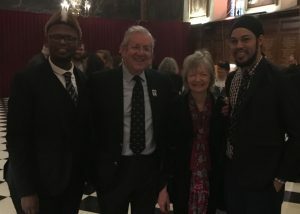 Thank you Michael Roulston for hosting Norval and Kagiso during their stay in London and Dulwich Prep London for sponsoring the two teachers flights in order to make this incredible opportunity a reality. We would also like to thank Dulwich for their ongoing support for Sparrow and we look forward to welcoming the teachers from Dulwich Prep soon. Thank you for all the generous donations at the 2016 ‘Celebration of Christmas’ in aid of Sparrow Schools. The eleventh fundraising event ‘Celebration of Christmas’ in aid of Sparrow Schools, took place on Thursday 8th December 2016 at the Royal Hospital Chelsea. The carol service was attended by special guests including John McCarthy, CBE, Journalist and Radio 4 presenter, Paddy O’Connell, presenter of Radio 4’s ‘Sunday Favourite’ Broadcasting House and David Robb, also known as Dr Clarkson in ITV’s Downton Abbey. Two teachers from Sparrow Schools, South Africa also attended the event. 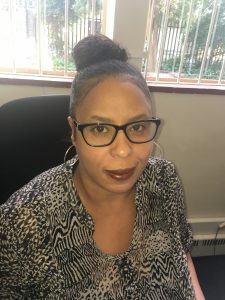 Norval Petersen, Science teacher at Sparrow Combined School and Kagiso Magano, English teacher at Sparrow Foundation School were selected for the first Teacher Exchange Programme between Sparrow Schools and Dulwich Prep College. The teachers read a letter from the Rays of Hope Children’s home, which recently sent ten pupils from the poorer township of Alexandra to Sparrow. The letter demonstrated to the audience how their donations are enabling Sparrow Schools to change the lives of disadvantaged children in Johannesburg. How can a French Quiz raise over £2,000? Pupils from King’s College School, Wimbledon presenting the cheque to Norval Petersen, Elizabeth Breaks and Kagiso Magano, from Sparrow Schools, South Africa. Are you stuck for ideas for fun, successful fundraising schemes to support Sparrow Schools? Perhaps you can gain inspiration from the staff and pupils at King’s College School (KCS), Wimbledon. Over the last seven years, KCS’s Modern Foreign Languages Department have supported Sparrow Schools Foundation through their annual French Culture Quiz. This year, they raised £2,215 from the famous ‘French Culture Quiz’. So how does a French Culture Quiz raise so much money? During the summer holidays, all pupils entering their final year at KCS (96 boys aged 12-13) are given a sixty-question quiz paper on French culture (Geography, History, Food & Drink, Idioms, Sport, Famous Faces etc.). They have the summer break to learn the answers to these questions and raise as many sponsorship pledges as possible (e.g. 50p per correct answer) and then in September KCS issue the quiz under exam conditions, with no notes allowed. When the boys receive their marks, they go back to their sponsors to collect their sponsorship money. This year four boys got 60/60 in the quiz and three boys managed to raise over £100. 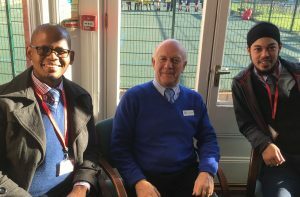 On Wednesday 7th December 2017, two teachers from South Africa, Norval Petersen and Kagiso Magano visited KCS. 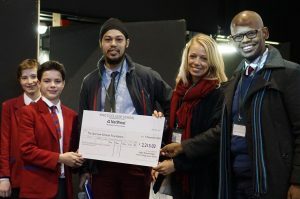 During the school’s morning assembly, Norval, Science Teacher at Sparrow, explained that the money raised by the boy’s French Quiz would be spent on scientific equipment — the pupils at Sparrow Schools, in Johannesburg, currently have limited access to these kinds of resources. Kagiso, English and Music Teacher at Sparrow, showed photos of the children from Johannesburg playing on the new musical equipment (drums and marimbas), which were purchased with the money donated by KCS in 2015. He explained how the equipment is used to help children who have experienced trauma and require therapy. After the assembly, the teachers spent time in the lessons meeting the KCS boys. Everyone was completely enraptured as they heard about Norval and Kagiso’s experiences at Sparrow Schools in South Africa. If your school would like to give back and support children with learning difficulties from disadvantaged backgrounds in Johannesburg, you can support the Bursary Scheme. £750 for three years will fund a bursary for a selected pupil at Sparrow. These bursaries are for young people who cannot pay basic school fees and receive no support from family members, government or other charities. Please contact lizzie@sparrowschools.co.za for further information and projects to support.